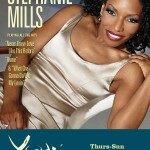 The incomparable Stephanie Mills is making a rare intimate club appearance at Yoshi’s San Francisco from June 14 – 17. She is performing one show each night. Tickets are still available for the Thursday 8pm and Sunday 3pm shows and they are moving fast. Flashback Friday – Stephanie Mills – Whatcha Gonna Do With My Lovin’?